Market gardening, tomatoes in particular had always been a major part of Peter’s life. He had worked on his father, Fred’s market garden in Waerenga Road early on. But thinking he wanted to be a farmer he went to Taihape to work on his uncle’s sheep farm. Finding it was not to his liking left after a year and went rabbit shooting with his friend Doug Mould before enrolling at Massey University to study for a Horticulture Diploma. He didn’t complete the course as his father needed him to help in the garden during the tomato season. This very quickly became his main focus in life, leaving behind his athletic interests and ability; he was a good long distance runner and high jumper, also played rugby for Rahui and Horowhenua. Peter and Ann married in 1958 and they built their first home in Waerenga Rd where their children, Chris and Lindsay first became involved with the tomato growing. In 1969 they purchased 33 acres of farmland in Ringawhati Road. Here he established a thriving market garden, tending 25,000 tomato plants plus gherkins — his father had been the first gherkin grower and Peter carried these on. People came from all over and the Jewish people came from Wellington to purchase their gherkins. Peter grew bulbs and daphne during the winter months and for many years he supplied about 300 bunches of daffodils for the Cancer Society Daffodil Day appeal. He also continued growing, with Ray Bertelsen, on the 10 acres his father and Vic Bertelsen shared in Swamp Road. But the tomatoes became unprofitable when Australian imports began and the death knell for growers came when the big supermarket chains demanded tomatoes of a certain size and colour all year round. As technologies developed Peter created the first computer programme for Massey University for third and fourth year students. Each area was broken down into units of time and cost for the students. Many students stayed with the Thorpe’s during their first year practical, before studying the theory at Massey. His first student was John Griffin, who later became his neighbour and friend. The students visited the garden every year and gave him some of their ideas, this was useful for Peter — it showed him statistics on down-time. “Peter neither encouraged nor discouraged the children from working in the garden — he made no imposition on them, though they all worked there over the years,” his widow Ann said. Daughter Chris and partner Ton Kuypers now own half of the original garden and still grow the flowers. 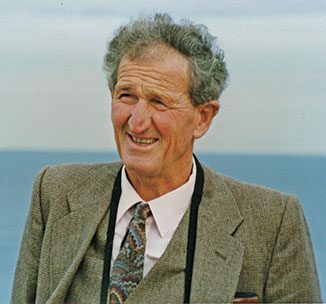 During his years as a grower, Peter was supportive of the other fruit, vegetable and flower growers in the district He was a member of the Otaki District Commercial Growers Association on which he served time as their president and delegate to the NZ Growers Federation as well as being a member of the Tomato Promotion Committee. His first overseas trip was with the Growers tour to Japan and later with Turners and Growers to China. Away from the garden he enjoyed trout fishing, hunting and tramping. Peter was a scout leader before his marriage and bible class leader when he and Ann first met. He was a member and president of the Lions Club, a foundation shareholder when the Otaki Growers Association was formed into a trust after they sold their building to Farmlands in 2003. The trust still operates and gives funds to Otaki causes and needs. It was a tribute to the standing Peter had in Otaki and around the country, that 300 people packed into the chapel barely 36 hours after his death. Peter Thorpe lived and worked for his family and was highly respected by all who worked with him.